Objective: Little is known about thrombolytic therapy patterns in patients with ST-elevation myocardial infarction (STEMI) in the Middle East. The objective of this study was to evaluate the clinical profile and mortality of STEMI patients who arrived in hospital within 12 hours from pain onset and received thrombolytic therapy. Patients and Methods: This was a prospective, multinational, multi-centre, observational survey of consecutive acute coronary syndrome patients admitted to 65 hospitals in six Middle Eastern countries during the period between October 2008 and June 2009, as part of Gulf RACE-II (Registry of Acute Coronary Events). Analyses were performed using univariate statistics. 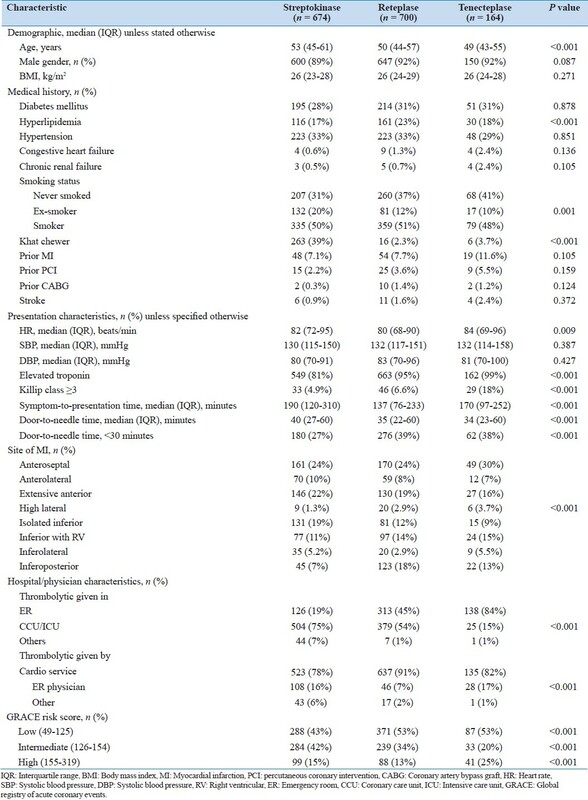 Results: Out of 2,465 STEMI patients, 66% (n = 1,586) were thrombolysed with namely: streptokinase (43%), reteplase (44%), tenecteplase (10%), and alteplase (3%). 22.7% received no reperfusion. Median age of the study cohort was 50 (45-59) years with majority being males (91%). The overall median symptom onset-to-presentation and door-to-needle times were 165 (95- 272) minutes and 38 (24-60) minutes, respectively. Generally, patients presenting with higher GRACE risk scores were treated with newer thrombolytic agents (reteplase and tenecteplase) (P < 0.001). The use of newer thrombolytic agents was associated with a significantly lower mortality at both 1-month (0.8% vs. 1.7% vs. 4.2%; P = 0.014) and 1-year (0% vs. 1.7% vs. 3.4%; P = 0.044) compared to streptokinase use. Conclusions: Majority of STEMI patients from the Middle East were thrombolysed with streptokinase and reteplase in equal numbers. Nearly one-fifth of patients did not receive any reperfusion therapy. There was inappropriately long symptom-onset to hospital presentation as well as door-to-needle times. Use of newer thrombolytic agents in high risk patients was appropriate. Newer thrombolytic agents were associated with significantly lower mortality at 1-month and 1-year compared to the older agent, streptokinase. Several thrombolytic agents currently being used differ with respect to fibrin affinity, fibrin specificity, method of administration (bolus vs. infusion), allergic reactions, and multiple other parameters. ,, Little is known about the use of various thrombolytic agents in the Middle East countries including the type of the agent used, whether they are appropriately used, as well as their impact on 30-day and 1-year mortality. The aim of the study was to evaluate the clinical characteristics and mortality of STEMI patients receiving TT in six Middle Eastern countries. Diabetes was defined as having a history of diabetes diagnosed and treated with medication and/or diet or fasting blood glucose 7.0 mmol/l (126 mg/dl) or greater. Hypertension was defined as having a history of hypertension diagnosed and treated with medication, diet, and/or exercise, blood pressure greater than 140 mmHg systolic or 90 mmHg diastolic on at least two occasions or as receiving any antihypertensive drug. Hyperlipidemia was defined as history of dyslipidemia diagnosed and/or treated by a physician or total cholesterol greater than 5.18 mmol/l (200 mg/dl), low-density lipoprotein greater than or equal to 3.37 mmol/l (130 mg/dl) or high-density lipoprotein less than 1.04 mmol/l (40 mg/dl). Current smoker was defined as smoking cigarettes or water-pipe (sheesha) or Khat chewer within 1 month of index admission. A positive family history for coronary artery disease was defined as evidence of coronary artery disease in a parent, sibling, or children before 55 years of age. Obesity was defined as body mass index (BMI) greater than 30 kg/m 2 . For each participating hospital, data were collected regarding site of thrombolysis, i.e., emergency room (ER) or coronary/intensive care unit (CCU/ICU), and whether thrombolysis was provided by cardiology service unit or ER physicians. Renal impairment in this study was defined as serum creatinine of >177 μmol/l (2 mg/dL). In-hospital medications recorded for the purpose of this study included aspirin, clopidogrel, statin, beta-blocker, angiotensin-converting enzyme inhibitor (ACEI), angiotensin receptor blocker (ARB), as well as the use of other dyslipidemic therapies. The study received ethical approval from the institutional ethical bodies in all participating countries. Descriptive statistics were used to describe the data. For categorical variables, frequencies and percentages were reported. Differences between groups were analyzed using Pearson's chi-square test (or Fisher's exact test for cells <5). For continuous variables, median and interquartile range (25 th and 75 th percentiles) were used to present the data while analysis was performed using the Kruskal Wallis test. An a priori two-tailed level of significance was set at the 0.05 level. Statistical analyses were conducted using STATA version 12.0 (STATA Corporation, College Station, TX). Among 2,465 STEMI patients who presented to the hospital within 12 hours of symptoms onset, 66.0% (n = 1,586) were thrombolysed while 7.6% (n = 183) had primary PCI. The rest of the STEMI population included those that were contraindicated to thrombolysis (3.7%; n = 88), while the remaining was the shortfall to reperfusion (22.7%; n = 544). Out of the cohort that was thrombolysed, 43% (n = 674) were treated with streptokinase, 44% (n = 700) with reteplase, 10% (n = 164) with tenecteplase, while the rest, 3% (n = 48) were given alteplase. For the purpose of this study and due to the small sample size of alteplase patients, only those that were treated with streptokinase, reteplase, and tenecteplase were included in this study (n = 1,538). Demographic, clinical, and hospital/physician characteristics are outlined in [Table 1]. The overall median age of the cohort was 50 (45-59) years with majority being males (91%). The overall median symptom onset-to-presentation was 165 (95-272) minutes with those treated with streptokinase presenting significantly late after symptom onset than those administered either reteplase or tenecteplase (190 vs. 137 vs. 170 minutes, respectively; P < 0.001). The overall median door-to-needle time was 38 (24-60) minutes with those treated with streptokinase having slight delay in door-to-needle times than those administered reteplase or tenecteplase (40 vs. 35 vs. 34 minutes, respectively; P < 0.001). There were also significantly fewer patients in the streptokinase group who had their door-to-needle times of <30 minutes than those on reteplase or tenecteplase cohorts (27% vs. 39% vs. 38%; P < 0.001). There were no significant differences in the majority of risk factors and clinical presentation among the three TT groups. Compared to the streptokinase group, the reteplase and tenecteplase cohorts were younger, more likely to have hyperlipidemia with a higher proportion of patients with higher GRACE risk scores. Thrombolytic agents were more likely to be administered by a cardio service unit than an ER physician. Streptokinase patients were more likely to be administered the thrombolytic agent in an ICU/CCU setting; however, the newer thrombolytic agents were more likely to be administered in an ER environment. [Table 2] presents medications use among STEMI patients in six Middle Eastern countries pre-admission, during in-hospital, and at discharge. There was a prominent use of aspirin (93%), while clopidogrel was prescribed in only 71% of the patients at discharge. Seventy percent of the patients (n = 1073) were on both aspirin and clopidogrel concurrently during admission. The other most commonly prescribed medication at discharge was statin (93%) followed by beta-blockers (82%). ACEIs were prescribed in 76% of the subjects while ARBs (4.3%) were infrequently used. There was clearly a marked increase in evidence-based cardiac medications use between pre-admission and in-hospital. Compared to the streptokinase group, the newer thrombolytic agents were associated with the increased use of clopidogrel, beta-blocker, and ACEI. The overall 30-day and 1-year mortalities were 2.68% and 2.21%, respectively. The effect of thrombolytic agents on 1-month and 1-year mortality is also shown in [Table 3]. Tenecteplase and reteplase patients were associated with a significantly lower mortality at 1-month compared to streptokinase patients (0.8% vs. 1.7% vs. 4.2%; P = 0.014). Furthermore, this reduction in mortality was also seen at 1-year, where tenecteplase and reteplase patients had lower mortalities when compared to the patients on streptokinase (0% vs. 1.7% vs. 3.4%; P = 0.044). The present study is the first to compare clinical characteristics among STEMI patients from the Middle East treated with three commonly used thrombolytic agents. The main findings from this study are: STEMI patients from the Middle East are predominantly male, young and are thrombolysed with streptokinase and reteplase in equal numbers; nearly one-fifth of eligible STEMI patient did not receive any reperfusion therapy; there was inappropriately long symptom-onset to hospital presentation time as well as door-to-needle time; use of newer thrombolytic agents in high risk patients was appropriate; and newer thrombolytic agents were associated with significant reduction in mortality at both 1-month and 1-year compared to the older agent, streptokinase. 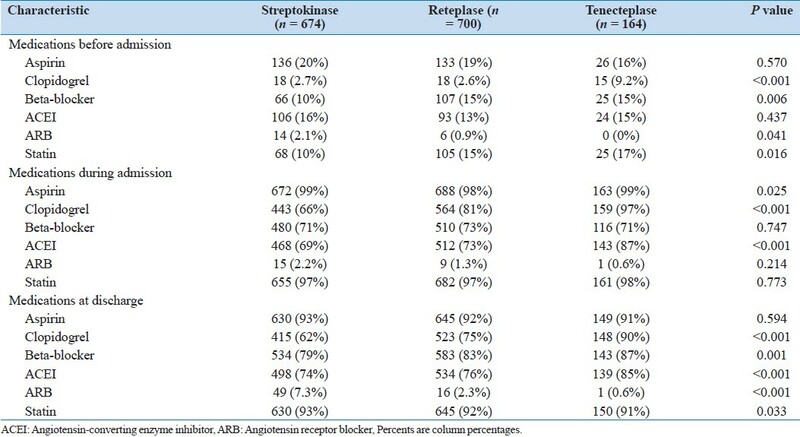 Out of the cohort that was thrombolysed; equal numbers of patients were treated with reteplase and streptokinase, even though guidelines recommend newer thrombolytic agents such as reteplase and tenecteplase which have the potential advantages of prolonged half-life (less re-occlusion rates), increased fibrin specificity (more potent and lower non-cerebral bleeding risk) and increased resistance to inhibition by plasminogen activators as well as increased 90-minute coronary patency rates (60-75% vs. 50% with streptokinase) and TIMI (Thrombolysis in Myocardial Infarction) grade 3 flow ( 60% vs. 32% with streptokinase). , The majority of patients in the higher GRACE risk score were treated with newer thrombolytic agents. This is in accordance with the guideline recommendations. One other observation from our data relates to the increased use of evidence based secondary prevention drug therapies in patients treated with newer TT when compared to streptokinase. Apart from the GUSTO-I trial  that demonstrated the superiority of alteplase over streptokinase, no other trial has demonstrated a reduced mortality with one thrombolytic agent in comparison with another. ,,,,, In two large meta-analysis comparing the efficacy of thrombolytics in acute myocardial infarction, Dundar et al.,  and Giraldz et al.,  reported that there was no significant differences in 30-35 days mortality among these three thrombolytic agents. In this registry, on univariate analysis, the use of newer thrombolytic agents was associated with significantly lower mortalities at both 1-month and 1-year. The mortality benefits of the newer thrombolytic agents in this registry may be related to more use of other evidence based medications with newer thrombolytic agents as demonstrated in this study as well as in CLARITY-TIMI-28 (Clopidogrel as Adjunctive Reperfusion Therapy-Thrombolysis in Myocardial Infarction)  and COMMIT (Clopidogrel and Metoprolol in Myocardial Infarction Trial)  trials. This study has clinical implications. The mortality benefit seen from newer thrombolytic agents suggests that there should be a change in the pattern of use of thrombolytic agents in the Middle East countries. The use of streptokinase needs to be discouraged. The cost consideration does not seem to be a factor in this population as treatment in the Middle Eastern countries is provided freely to their citizens. As with any registry study, confounding or unknown variables could have influenced the results especially with the fact that multivariable techniques were not employed due to low study power. Furthermore, losses to follow-up at both, 1-month and 1-year, could have biased the results either way. Although Gulf RACE included a broad representation of hospital types, there is a probability that some of the participating centres may not be fully representative of their countries with respect to STEMI management. However, registry data does provide crucial complementary evidence and hence the results are more likely to reflect clinical practice. The majority of STEMI patients from the Middle East were thrombolysed with streptokinase and reteplase in equal numbers. Nearly one-fifth of patients did not receive any reperfusion therapy. There was inappropriately long symptom-onset to hospital presentation as well as door-to-needle times. Use of newer thrombolytic agents in high risk patients was appropriate. Newer thrombolytic agents were associated with significantly lower mortality at both 1-month and 1-year compared to the older agent, streptokinase. Gulf RACE-2 is a Gulf Heart Association project supported by Sanofi-Aventis, Paris, Qatar. The sponsors had no involvement in the study conception or design; data collection, analysis, or interpretation of data; writing, review, or approval of the manuscript; or the decision to submit the manuscript for publication. 1. Kushner FG, Hand M, Smith SC Jr, King SB 3 rd , Anderson JL, Antman EM, et al. 2009 Focused updates: ACC/AHA guidelines for the management of patients with ST-elevation myocardial infarction (updating the 2004 guideline and 2007 focused update) and ACC/AHA/SCAI guidelines on percutaneous coronary intervention (updating the 2005 guideline and 2007 focused update): A report of the American College of Cardiology Foundation/American Heart Association Task Force on Practice Guidelines. Circulation 2009;120:2271-306. 2. van de Werf F, Bax J, Betriu A, Blomstrom-Lundqvist C, Crea F, Falk V, et al. Management of acute myocardial infarction in patients presenting with persistent ST-segment elevation: The Task Force on the Management of ST-Segment Elevation Acute Myocardial Infarction of the European Society of Cardiology. Eur Heart J 2008;29:2909-45. 3. Keeley EC, Boura JA, Grines CL. Primary angioplasty versus intravenous thrombolytic therapy for acute myocardial infarction: A quantitative review of 23 randomised trials. Lancet 2003;361:13-20. 4. Waters RE 2 nd , Singh KP, Roe MT, Lotfi M, Sketch MH Jr, Mahaffey KW, et al. Rationale and strategies for implementing community-based transfer protocols for primary percutaneous coronary intervention for acute ST-segment elevation myocardial infarction. J Am Coll Cardiol 2004;43:2153-9. 5. Chakrabarti A, Krumholz HM, Wang Y, Rumsfeld JS, Nallamothu BK, National Cardiovascular Data Registry. Time-to-reperfusion in patients undergoing interhospital transfer for primary percutaneous coronary intervention in the U.S: An analysis of 2005 and 2006 data from the National Cardiovascular Data Registry. J Am Coll Cardiol 2008;51:2442-3. 6. Panduranga P, Sulaiman K, Al-Zakwani I, Zubaid M, Rashed WA, Al-Mahmeed W, et al. Utilization and determinants of in-hospital cardiac catheterization in acute coronary syndrome patients from the Middle East. Angiology 2010;61:744-50. 7. Binbrek AS, Rao NS, van der Werf F, Sobel BE. Meta-analysis of studies of patients in the United Arab Emirates with ST-elevation myocardial infarction treated with thrombolytic agents. Am J Cardiol 2010;106:1692-5. 8. An international randomized trial comparing four thrombolytic strategies for acute myocardial infarction. The GUSTO investigators. N Engl J Med 1993;329:673-82. 9. Fibrinolytic Therapy Trials' (FTT) Collaborative Group. Indications for fibrinolytic therapy in suspected acute myocardial infarction: Collaborative overview of early mortality and major morbidity results from all randomized trials of more than 1000 patients. Lancet 1994;343:311-22. 10. International Joint Efficacy Comparison of Thrombolytics (INJECT) Investigators. Randomised, double-blind comparison of reteplase double-bolus administration with streptokinase in acute myocardial infarction (INJECT): Trial to investigate equivalence. Lancet 1995;346:329-36. 12. Granger CB, Goldberg RJ, Dabbous O, Pieper KS, Eagle KA, Cannon CP, et al. Predictors of hospital mortality in the global registry of acute coronary events. Arch Intern Med 2003;163:2345-53. 13. Mandelzweig L, Battler A, Boyko V, Bueno H, Danchin N, Filippatos G, et al. Euro Heart Survey Investigators. The second Euro Heart Survey on acute coronary syndromes: Characteristics, treatment and outcome of patients with ACS in Europe and the Mediterranean Basin in 2004. Eur Heart J 2006;27:2285-93. 14. Eagle KA, Nallamothu BK, Mehta RH, Granger CB, Steg PG, van de Werf F, et al. Trends in acute reperfusion therapy for ST-segment elevation myocardial infarction from 1999 to 2006: We are getting better but we have got a long way to go. Eur Heart J 2008;29:609-17. 15. Mathews R, Peterson ED, Li S, Roe MT, Glickman SW, Wiviott SD, et al. Use of Emergency Medical Service Transport Among Patients With ST-Segment-Elevation Myocardial Infarction: Findings From the National Cardiovascular Data Registry Acute Coronary Treatment Intervention Outcomes Network Registry-Get With the Guidelines. Circulation 2011;124:154-63. 16. Fares S, Zubaid M, Al-Mahmeed W, Ciottone G, Sayah A, Al Suwaidi J, et al. Utilization of Emergency Medical Services by Patients with Acute Coronary Syndromes in the Arab Gulf States. J Emerg Med 2011;41:310-6. 17. Spencer FA, Montalescot G, Fox KA, Goodman SG, Granger CB, Goldberg RJ, et al. Delay to reperfusion in patients with acute myocardial infarction presenting to acute care hospitals: An international perspective. Eur Heart J 2010;31:1328-36. 18. Schiele F, Hochadel M, Tubaro M, Meneveau N, Wojakowski W, Gierlotka M, et al. Reperfusion strategy in Europe: Temporal trends in performance measures for reperfusion therapy in ST-elevation myocardial infarction. Eur Heart J 2010;31:2614-24. 19. Birkhead J; National Audit of Myocardial Infarction Project. Where are we today? Early results from MINAP, the National Audit of Myocardial Infarction Project. Heart 2003;89(Suppl 2):ii13-5; discussion ii35-7. 20. Bode C, Smalling RW, Berg G, Burnett C, Lorch G, Kalbfleisch JM, et al. Randomized comparison of coronary thrombolysis achieved with double-bolus reteplase (recombinant plasminogen activator) and front-loaded, accelerated alteplase (recombinant tissue plasminogen activator) in patients with acute myocardial infarction. The RAPID II Investigators. Circulation 1996;94:891-8. 21. A comparison of reteplase with alteplase for acute myocardial infarction. The Global Use of Strategies to Open Occluded Coronary Arteries (GUSTO III) Investigators. N Engl J Med 1997;337:1118-23. 22. Cannon CP, Gibson CM, McCabe CH, Adgey AA, Schweiger MJ, Sequeira RF, et al. TNK-tissue plasminogen activator compared with front-loaded alteplase in acute myocardial infarction: Results of the TIMI 10B trial. Thrombolysis in Myocardial Infarction (TIMI) 10B Investigators. Circulation 1998;98:2805-14. 23. van De Werf F, Adgey J, Ardissino D, Armstrong PW, Aylward P, Barbash G, et al. Assessment of the Safety and Efficacy of a New Thrombolytic (ASSENT-2) Investigators. Single-bolus tenecteplase compared with front-loaded alteplase in acute myocardial infarction: The ASSENT-2 double-blind randomised trial. Lancet 1999;354:716-22. 24. Dundar Y, Hill R, Dickson R, Walley T. Comparative efficacy of thrombolytics in acute myocardial infarction: A systematic review. QJM 2003;96:103-13. 25. Giraldez RR, Wiviott SD, Nicolau JC, Mohanavelu S, Morrow DA, Antman EM, et al. Streptokinase and enoxaparin as an alternative to fibrin-specific lytic-based regimens: An ExTRACT-TIMI 25 analysis. Drugs 2009;69:1433-43. 26. Sabatine MS, Cannon CP, Gibson CM, López-Sendón JL, Montalescot G, Theroux P, et al. CLARITY-TIMI 28 Investigators. Addition of clopidogrel to aspirin and fibrinolytic therapy for myocardial infarction with ST-segment elevation. N Engl J Med 2005;352:1179-89. 27. Chen ZM, Jiang LX, Chen YP, Xie JX, Pan HC, Peto R, et al. COMMIT (ClOpidogrel and Metoprolol in Myocardial Infarction Trial) collaborative group. Addition of clopidogrel to aspirin in 45,852 patients with acute myocardial infarction: Randomised placebo-controlled trial. Lancet 2005;366:1607-21. 3 Door to Balloon Time: Is There a Point That Is Too Short?